You may remember the times when families were sitting at a table rolling dice and using a game board to play. This one is the electronic version of a dice for modern kids. It won't roll off the table. Let's get ready to roll. The start button will wake up the controller from sleep mode and the center led lights up to show the button is pressed. The program then counts the time while the start button is pressed and calculates a random roll time. When the button is released the dice start rolling, fast at first then slower and then stop to show the result. If the start button is not pressed then after about 10 seconds it goes to sleep mode again and the leds turn off. 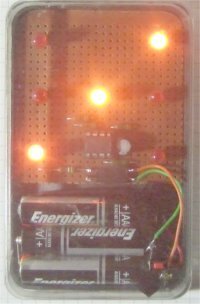 No on-off switch is needed here, it draws only few microamps in sleep mode. 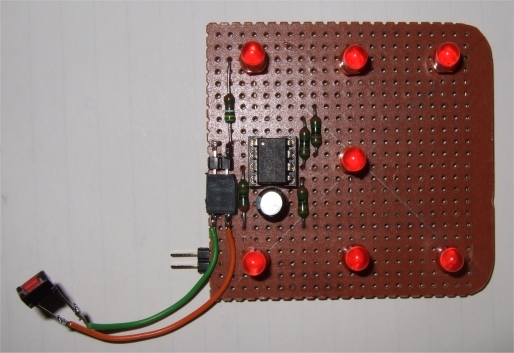 It can be done easily with a few parts only : the AT15 controller, a switch, some resistors and 7 leds. 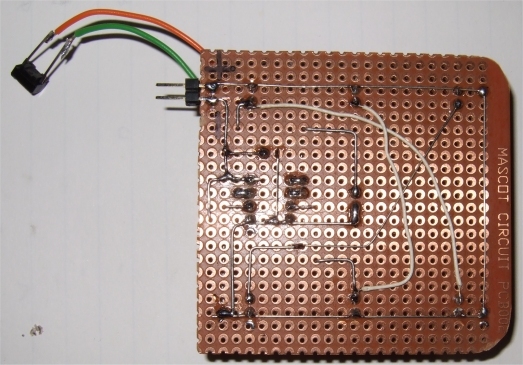 The center led is connected to PB0, the other leds are wired in parallel to the other ports, it needs only 4 output ports to display all possible combinations of a dice. 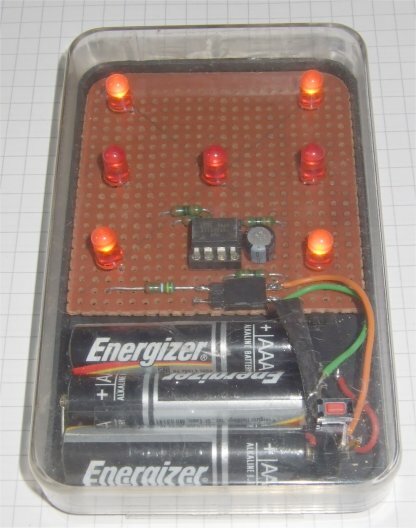 For example to show a 3 the lower left and upper right leds and the center led are turned on. The start button is on PB4 and a Pin change Interrupt wakes up the AT15 from sleep mode. How random will it be? It looks good to me but an improvement would be using a digital pseudorandom noise generator (described elsewhere) to generate the result displayed. To keep it simple the start button press down time is counted. Unlikely to get the same time twice, let's call it random for now. Dice in a box. When it's ready it has the size of a smartphone. If you can find a smartphone app, don't build it.